Baby activity gym, play mat, play gym, floor gym, play mat gym ... have you ever wondered what is the difference between all of them? Actually, they basically mean the same thing - a bright, colourful and interactive mat that your baby can play on during play time. Find and compare the best Black Friday and Cyber Monday bargains these leading brands have to offer this year (they make for one wonderful Christmas or baby shower gift)! The Skiphop Treetop Friends Activity Gym is one of the best baby activity gym in the market that has everything you need at a reasonable and affordable price. This much-loved infant gym engages baby with friendly faces and multi-sensory features, such as the 5 hanging toys attach to a 13 easy-to-hang loops for the small hands to grab. A mirror and built-in-sounds as well as textures on the oversized round mat surface add to the fun and sensory experience, apart from the 17 developmental activities for your little one to explore and play on. As an infant activity gym, the Skip Hop also comes with a matching supportive tummy time pillow that has a plush surface on one side and a fun print on the other to support your baby's chest. 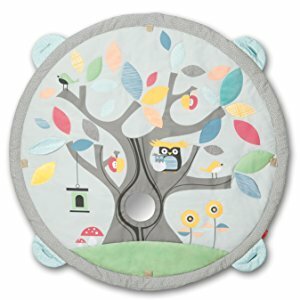 Remove the linen and patterned arches as well as hanging features and you'll get a flat play mat that is made of multiple fabrics with activities on it: crinkle leaves, squeaker flower and baby-safe mirror in the tree trunk (mirror is removable for machine-washing) that you can either use as a diaper change mat or for baby to sit on and play as he grows older. Having gone through rigorous safety tests, the Skiphop Treetop Friends Activity Gym met and exceeded ASTM, CPSIA, EN71 and other applicable safety standards so you can rest assured that it does not contain any toxic materials like BPA, PVC and phthalate that will harm the body. It literally takes two minutes to assemble and disassemble this baby gym, so you can easily reclaim your adult space when it is not in use. There are actually a few other skip hop activity gym designs to choose from, such as this alphabet play mat and this one here, the latter of which is also a bestseller if the treetop design does not tickle your fancy. Next is The Play Gym by Lovevery that is developed by child development experts and has been rigorously tested in labs and with real families who, needless to say, LOVE it! This award-winning activity gym and playmat is distilled by experts to their simplest purpose - to be exactly what children need at each stage. 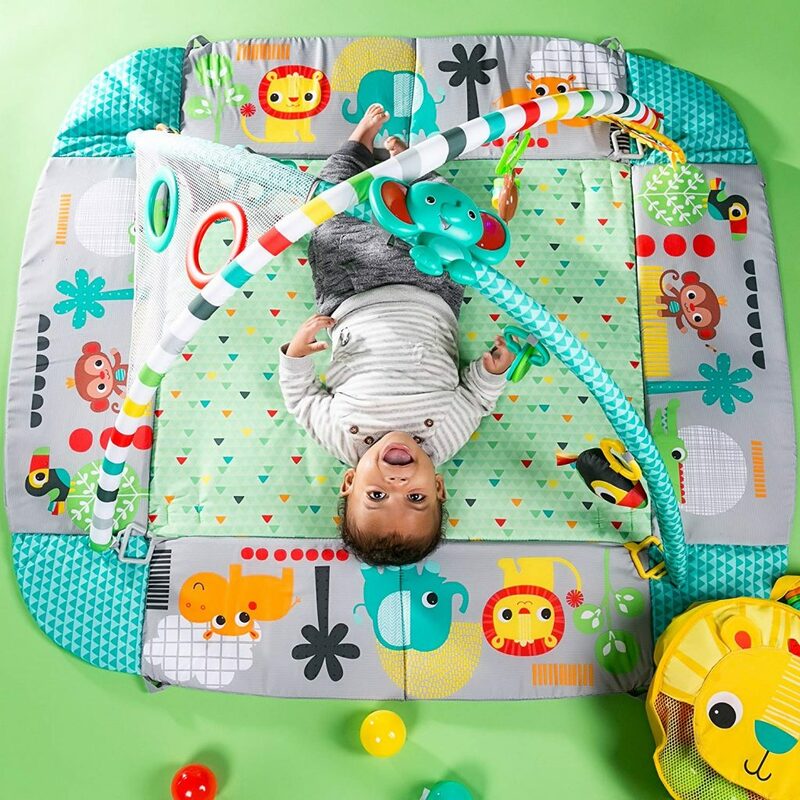 From tummy time to play fort, this play mat grows with your baby with its 5 development zones on the mat - reveal or conceal to prevent overstimulation, teach focus, sound making, encourage sensory exploration, hiding and finding, and exploring colours. This, together with the removable accessories like organic ball and teether, sustainable wood batting toy and 4 interchangeable learning card sets help develop baby's physical, cognitive, visual and motor learning skills step by step at each stage through play. This play mat also includes a Play Space Cover which instantly transform the mat into a cozy space for your growing baby and their friends to play. Not just that, the included Play Guide provides dozens of ideas and activities for fun stage-based play from newborn through 12+ months. What we really like about The Play Gym by Lovevery is that it uses materials that are completely non toxic to provide an absolutely safe place for baby to play at. The legs/arches and batting ring are made from sustainably-sourced wood, while teething toys are made with 100% organic cotton. 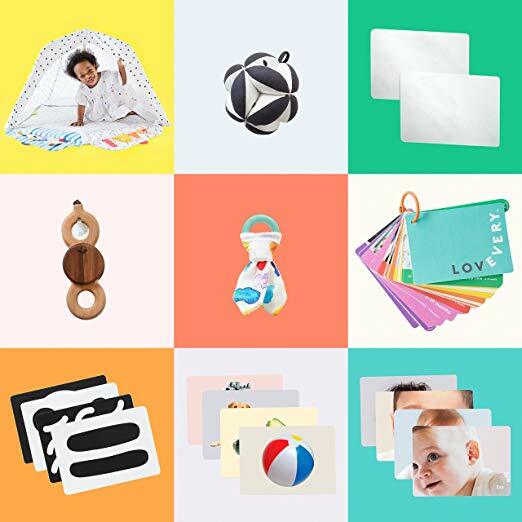 All machine-washable polyester components are manufactured without BPA and phthalates and it uses a water-based non-toxic finish, even the learning cards are printed with soy ink. However, this also means that it is on the pricier side, but for a top quality, non toxic activity gym that has everything you need from batting to teething to learning to focus for a whole year of play? We think it is worth the money spent. The Baby Einstein Activity Gym is perhaps not unfamiliar to many of you - this baby play gym is one of the bestseller, understandably so, because it has so many features to love. If you want to give your little one a multi-sensory adventure that explores all the sights and sounds of the ocean, this is the one to go for. Brightly coloured in an ocean theme, this play gym will captivate your baby whether they're lying on their back watching the aquatic toys, or spending tummy time cozied up at the accompanying whale prop pillow. 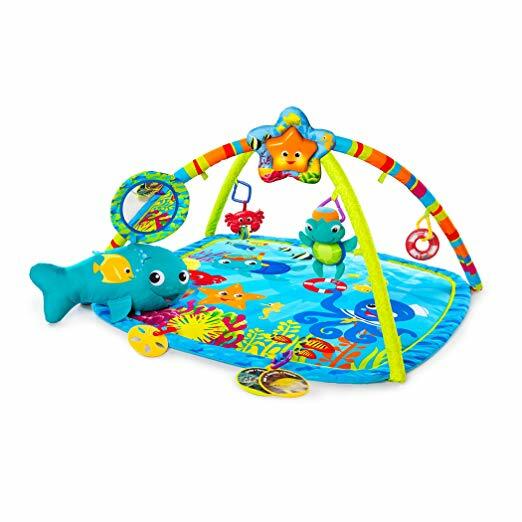 Other developmental toys with this play mat include a crab bead chaser, sand dollar toy, ring rattle, baby-safe mirror and flash cards featuring real-life ocean imagery. 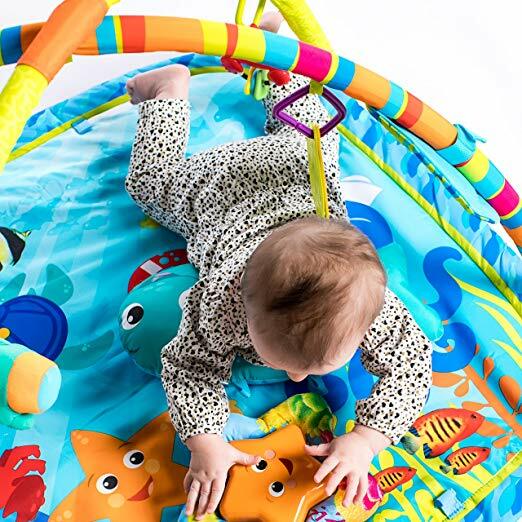 Measuring at 35"x35", this Baby Einstein Activity Gym is not the biggest but is of the perfect size for tummy time, lay and play as well as sit and play. 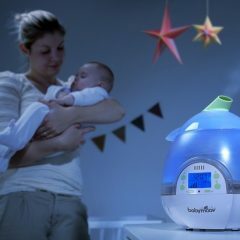 The main feature of this baby gym is to engage baby with music and lights, which is why it has a 3-in-1 starfish toy that plays 8 classical melodies (totalling to 25 minutes) with dancing lights that babies can activate themselves. What we really like is that you can easily detach the starfish from the baby gym and take it on-the-go or place in baby’s crib for soothing ocean sounds. 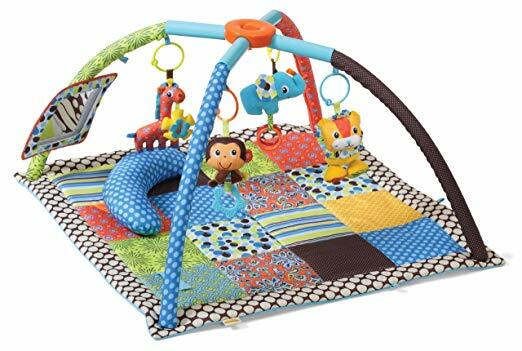 This baby einstein play mat is made of fabrics that are machine washable whereas all other parts can be wiped clean. 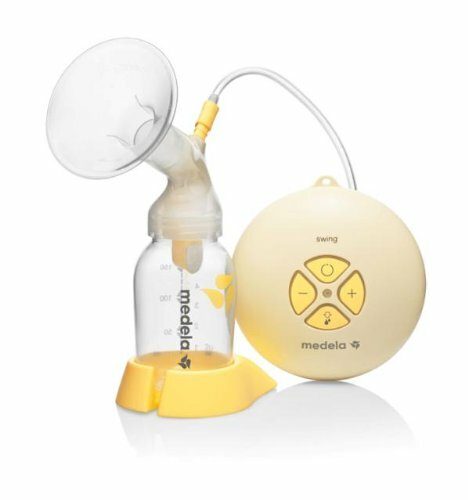 No rubber latex or phthalate, lead and BPA goes into its production so you can be sure it is safe for baby. For a simple flat play mat, we recommend the Tiny Love Meadow Days Super Mat. 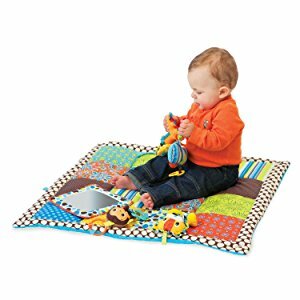 This large play mat is perfect for those that are learning to crawl because it provides ample space that is enough for two for your baby to explore. Sometimes, activity gyms like the Baby Einstein may be too small for your baby to crawl about, even after you remove the arches so this one here is just perfect. While it may not have hanging toys or features like those that come with arches, the Tiny Love Super Mat offers a variety of engaging activities in its own to encourage your baby's development. Each area provides different types of stimuli to encourage motor skills - from a crinkly fox tail to an engaging peek-a-boo tree, its variety of textures, images and toys provide baby with a space to be entertained as s/he learn important tactile and developmental skills. One thing that we like about this baby floor gym is how easy it is to fold it into a compact size. This makes it perfect for taking along to the beach, the park or anywhere, no longer limited as an indoor gym only for your baby! The Tiny Love Meadow Days Super Mat is made of soft cloth material with plush padding hence it is not stiff or scratchy, thus explaining its easy-to-fold ability. Do note that while it cushions tumbles from crawling or sitting up, it is not for any fall that results from standing up or say, from a chair (for a large play mat that is able to provide better cushioning effect, these ones mentioned here are better alternatives) which is why we say it is perfect for crawling learning and tummy time, apart from its size. 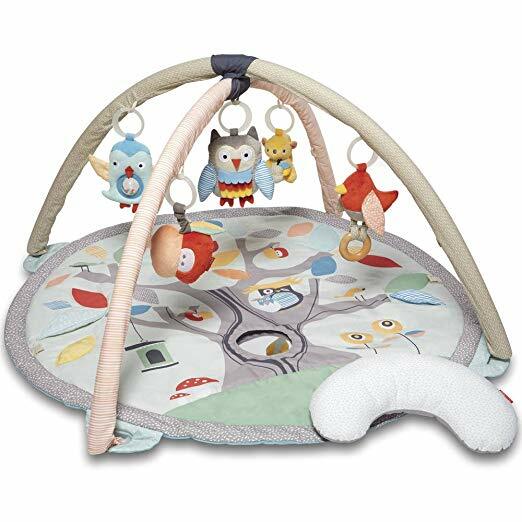 Nonetheless, it is one value-for-money infant play gym with features like a soft padded mirror that promotes facial recognition and cute carrot teether to soothe those teething time during playtime. No surprises there - of course there will be a Fisher Price activity gym on our list because they simply make some of the best baby play gyms in the market but today, we're not going to talk about the baby jungle gym that the brand is famous about, rather, it is this Deluxe Kick 'n Play Piano Gym that we think is also one of the best baby play gym that the brand has produced. 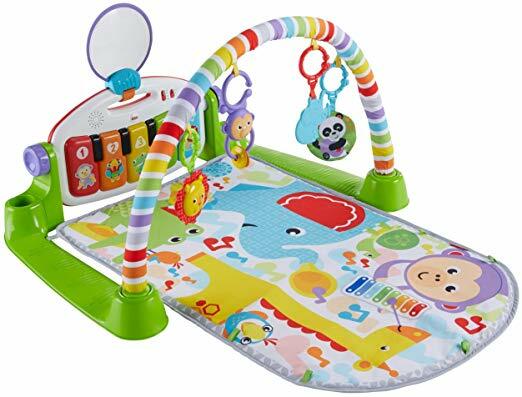 Boasting an average rating of 4.8/5 from its users, this fisher price baby play mat is a musical gym with a large and colorful play mat, repositionable toy bar with five baby gym toys (self-discovery mirror, elephant teether, crinkle panda, lion rattle & monkey cymbal clackers) and a removable light-up piano. 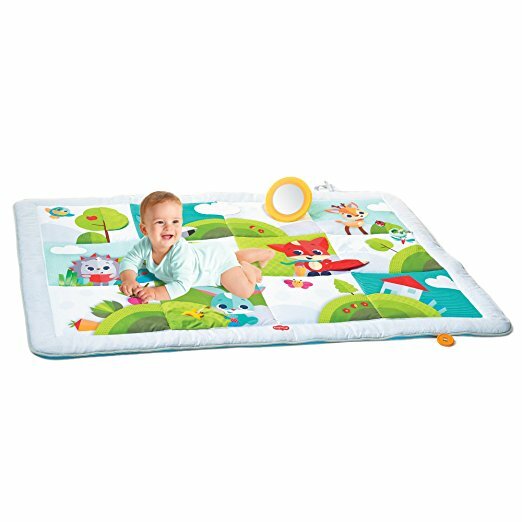 There are 4 ways to play with this baby play mat gym - lay and play, tummy time, sit and play, and take along. What we really like about this musical play mat is that the learning content can be changed with baby's age and stage using the Smart Stages technology. At newborn stage, use the Sense stage which plays up to 20 minutes of continuous playful music, lights and sounds to engage and stimulate their senses before switching to Discover at 3 months +, a series of short songs about animals and the sounds they make. When baby reaches 6 months, it is time to Explore with songs and phrases that introduce colours, shapes and numbers. Bonus: the large keyboard with 5 light-up keys can be removed and take along for play - it presses for real piano notes! But before that, the little muscles can get a big workout as your baby kicks, reaches and, pushes up. 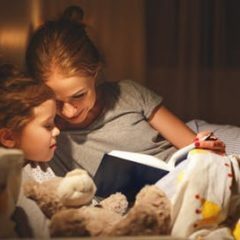 Plus, as littles ones discover how to activate the music and sounds by pressing the piano keys, they'll learn that their actions can make fun things happen. 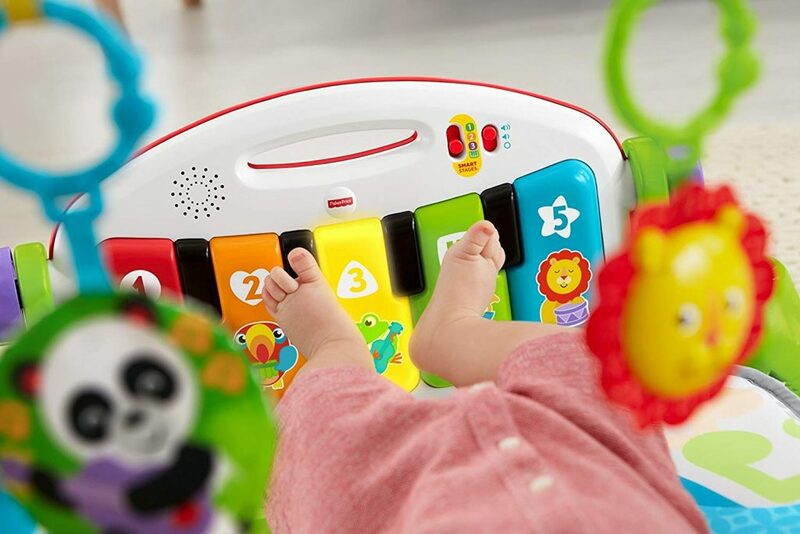 Overall, the different development stage that comes into play with the Fisher-Price Deluxe Kick 'n Play Piano Gym is one awesome feature to have as you can change the learning content to best fit your baby's age and stage to develop their sensory and gross motor skills as well as feed to their curiosity and wonderment. 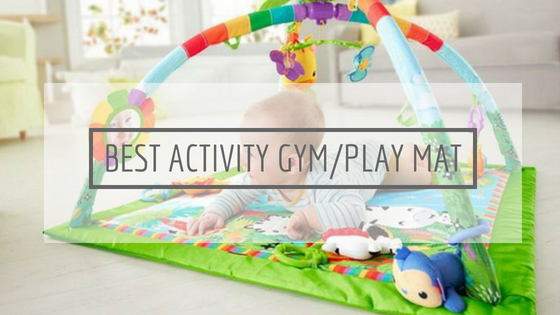 Under $50, this baby playmat and gym is a good steal that will provides loads of fun for your little one. Not just a baby gym, the Bright Starts Activity Gym is also convertible into a ball pit - yep, that ball pit we all had so much fun in as a kid ourselves! Unlike a standard activity gym, this baby mat can be adjusted up or down to create walls to contain your baby right where you want him to be, or – you guessed it – fill the play gym with bouncy, bobbling, bubbly balls! Now you can bring the joy of a ball pit right to your living room without exposing your little one to all the germs that are present in a public ball pit (oh, the horror stories you've heard!). For younger babies, the jumbo activity play mat lays flat for tummy time. Playtime is all around with engaging toys, crinkle fabrics and rattles and the 20 minute melodies will surely add years of fun from tummy time to toddler. Not just in an infant jungle gym design, the Bright Starts 5-in-1 Your Way Ball Play Activity Gym is also available in pink so for those that are looking for a pink play mat for your little princess, you know what to get. Certified by accredited independent laboratories such as Intertek Testing Services (ITS) and Bureau Veritas (BV), you can be sure that the bright starts baby play mat is not made from natural rubber latex nor any material that contains phthalate, lead or BPA. A simpler version of the Bright Starts is the Ingenuity 2-in-1 Travel Bed and Play Mat which have sides that can be folded up as well, but does not have features like hanging toys and arches. 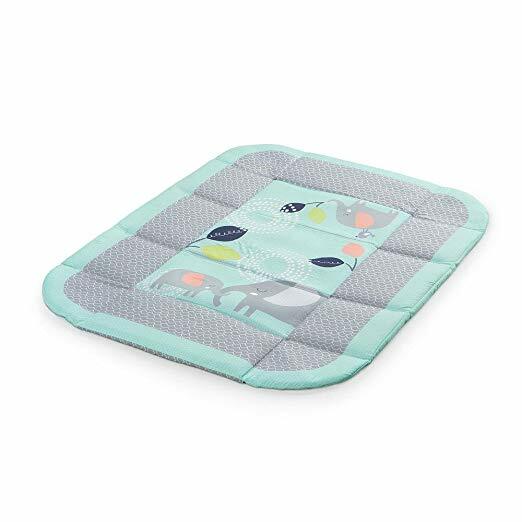 Nonetheless, as its name suggests, this baby gym mat can be converted into a portable bed when all four sides are folded up and connected so that's a plus feature to have. You may not be able to make it into a ball pit though, its size is a tad too small for that unlike that of Bright Starts' but it is enough to create a secure barrier if you want to keep your little one contained. As you can see from the picture on the left, once the sides are opened up, it turns into a large mat for baby to sit and play at. 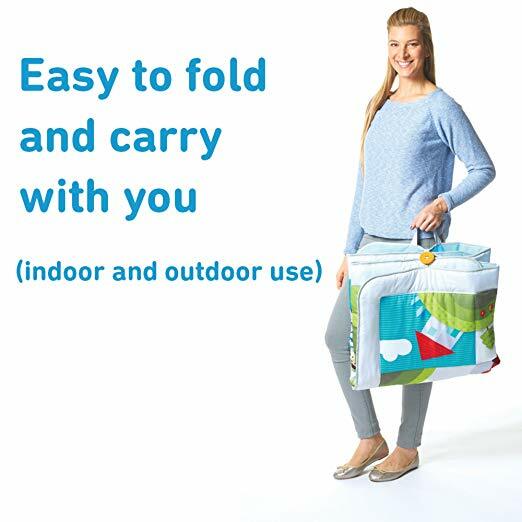 To make transporting easy, it folds up compactly with a carry handle which makes it ideal for trips, family visits and any time baby needs to nap away from home. 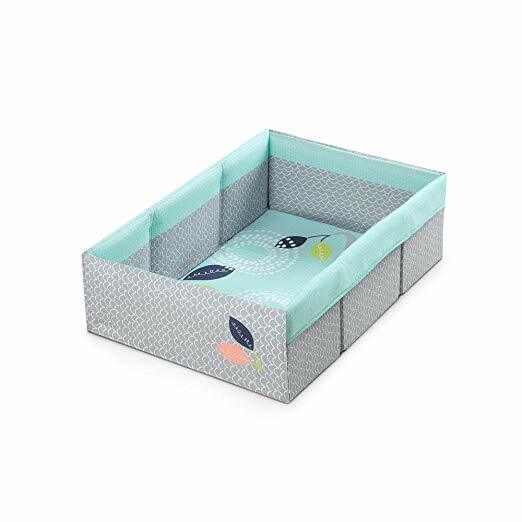 In a way, you can say that the Ingenuity 2-in-1 Travel Bed and Play Mat is rather similar to a travel crib like these, however, the difference is that it can be opened up like a mat which travel cribs fail to do (although they make for playards in another sense). We think it is a good choice for those who travel a fair bit but keep in mind that this activity gym has an age range from birth to approximately 1 year old only, after which your little one may have outgrown the travel bed version. Rest assured though, the play gym will last a good few years for baby to sit on and play as he grows older. 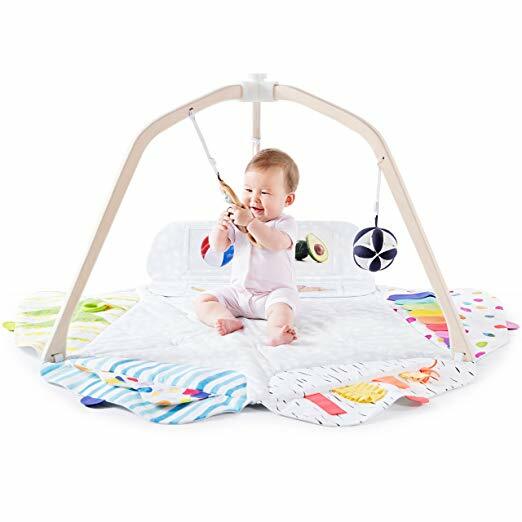 The Infantino Twist and Fold Activity Gym is another popular baby activity play mat that has received very high ratings thanks to its portability and price point. 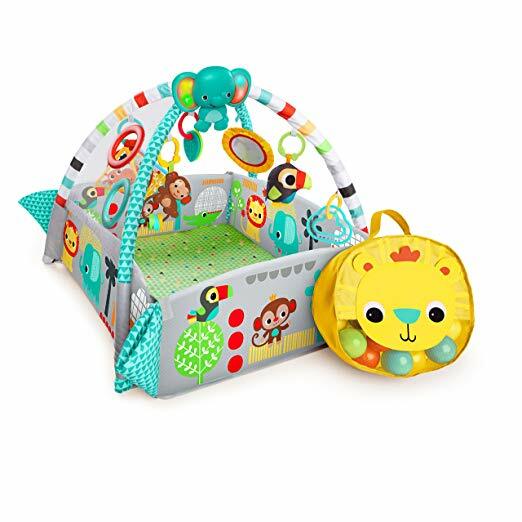 As a baby activity gym, it is loaded with a tummy time bolster, peek n' see mirror, a brightly coloured play mat and four linkable plush play pals. Undeniably, this is a rather simple activity gym (compare to the Fisher Price activity gym) but it is enough for sit and play as well as tummy time. To open the Infantino activity gym, push until you hear the click. When play time is down, a simple twist of the wrist using the brand's exclusive Twist & Fold technology collapses the arms of the gym (as pictured left) for compact storage. For a simple, fuss free baby soft play mat that is easy to pack for travel, the Infantino Twist and Fold Activity Gym is a good choice to consider. If you'd want something more, there is another model that comes with a ball pit (40 colourful balls included) for those that'd want to give their baby a little more fun. It is important that the play mat / activity gym you choose for baby is 100% safe to ensure his health and wellbeing. This is why you do not see much foam mats recommendation here because they are not of the best material - read more of why here.